As the winds of change sweep the world, and as tensions seething beneath the surface of Elven society threaten to break into open revolt, Shana meets the ancient tribe. Could an age-old secret free Shana and her people... or will its discovery call down their doom? ©1995 Mercedes Lackey, Andre Norton (P)2011 Brilliance Audio, Inc.
Andre Norton is one of my favorite authors, and here she has teamed up with Mercedes Lackey, and created such a rich world of Elves, Wizards, and Dragons as to be totally amazing. I found this book hard to get into at first, because of the detail, but once I got into it, I was hooked. It tells of Dragons in their home lairs, and gives insight into the lives of Dragons as few novels do. It shows High Elves as the haughty overlords they can be, and tells of the Humans caught in their web. It also shows what can happen when Elves and Humans cross blood!!! Decent storyline but this story ends WAY too quickly. The book spends tons of time describing outfits hair eyes and walking of characters ect while evading the prime storyline, especially the ending I was expecting a great battle for an end with time spent within it. While I appreciate some description of the character and environmental aspects...in many ways I found it overdone and the ending I felt was VERY rushed. It left me very disappointed! Book one of this storyline I found just as bad...and as of the third quarter of 2018, book 3 is not available on audio book. I will be requesting a refund of these books since they did not give me a feeling of adventure and satisfaction that I get with most books. 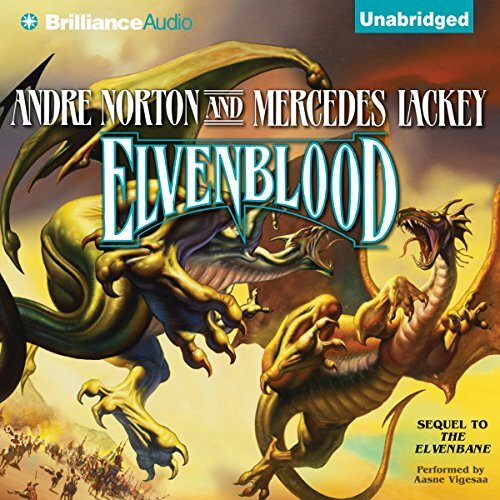 Would you consider the audio edition of Elvenblood to be better than the print version? Enjoyed hearing how the Elven and other names were pronounced. Great voice inflections! Which character – as performed by Aasne Vigesaa – was your favorite? If it did not start off with so much complaining, perhaps it would have worked. What could Andre Norton and Mercedes Lackey have done to make this a more enjoyable book for you? Remove the set-up scenes where people complain about the Elvenbane. Would you be willing to try another one of Aasne Vigesaa’s performances? What character would you cut from Elvenblood? The first book was fantastic. I dont know what happened here. I love it as a second book it was definitely refreshing. What's next, I'm ready. love the story. the concept of it is brilliant. cant wait for the next instalment/final book. my only regret is that the author has an annoying way of reading. i like her voices/dialects for the characters but her normal voice put me off initially. i had to force myself to go beyond that to finish the book. 1. The series is incomplete. One of the authors has died and we may (or not) see the fourth book published by the other author. 2. AUDIBLE ISN'T SELLING the THIRD BOOK and that's just unfair. it was a very good book I thought it seemed a little rushed though, it seemed to speed through parts you wanted a little more detail on, and slow down when you thought lets move on to the next bit, overall well worth it.